Think like a scientist or engineer – be a scientist or engineer! Sign up now for the 2014 Lowcountry Science and Engineering Fair! Find out more and register at http://lhsm.cofc.edu/lowcountry-science-fair/index.php. See you there! Join us for the 2nd annual STEM Education Day presented by the College of Charleston School of Science and Mathematics, the Lowcountry Hall of Science and Math, and the Lady Cougars Basketball team. Experience hands-on activities and demonstrations related to science, technology, engineering and math by College of Charleston Faculty as well as local STEM organizations and then enjoy the Lady Cougars basketball game against James Madison University. Our first-ever celebration of evolutionary science for children and youth! Admission to all events free, but most require reservations. Check out Piccolo Darwin 2014 for more information. From the Big Bang to the scientific method, Jamie Dunbar explains the origins of the universe, life on Earth and the human race in The Universe Verse, a series of scientifically accurate, rhyming comic books. What do females want? And just how far are males willing to go to win a mate and pass on their genes? You’d be surprised at what animals do for love! International wildlife photographer Scott Snider will present a fun and fascinating look at courtship in the animal kingdom. In 1977, scientists diving in the submersible Alvin made a stunning discovery on the bottom of the Pacific Ocean: vents pouring incredibly hot, mineral-rich, acidic fluids from beneath the seafloor, inhabited by previously unknown organisms thriving on “toxic” compounds in the absence of sunlight. Marine geologist Dr. Leslie Sautter and marine biologist Dr. Craig Plante will present awe-inspiring video of the one-mile deep hydrothermal vent ecosystem found on Axial Seamount. 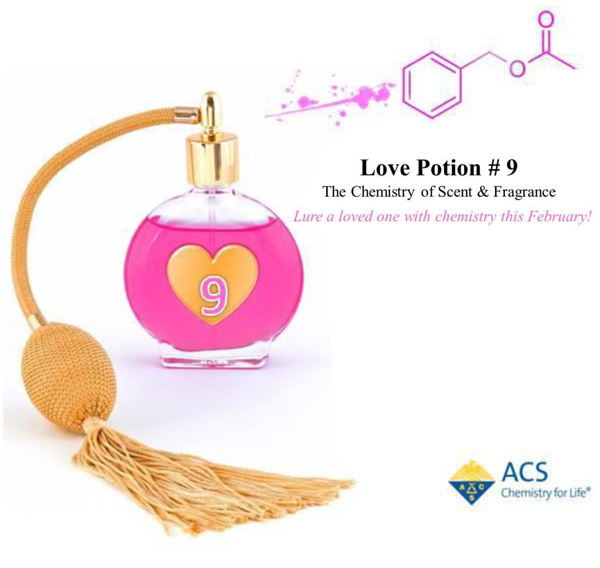 Join the Department of Chemistry this Tuesday evening for Love Potion #9: The Chemistry of Scent and Fragrance.